This review attempts to highlights the diagnostic potential of EUS-FNA, its complications, for finally focusing on its current indications. EUS-FNA is also considered very useful for the diagnosis of other type of pancreatic tumors. For instances, it has a high sensitivity and diagnostic accuracy for the evaluation of neuroendocrine tumors. , Even more, EUS-FNA is very helpful in assessing the malignant behavior of this type of pancreatic tumors, being able also to predict 5-year survival. , Determination of Ki-67 expression, key in the evaluation of neuroendocrine tumors, can also be evaluated in EUS-FNA samples. , Metastatic lesions can also be demonstrated by EUS-FNA; in a series of 114 consecutive patients with focal pancreatic lesions identified on CT, EUS-FNA allowed demonstration of metastases of an extrapancreatic cancer in 11% of cases. Finally, in cases suspicious for autoimmune pancreatitis or pancreatic lymphoma, where pancreas sampling is indicated, EUS-FNA has also shown to have a very important role. EUS-FNB in these cases is essential, since surgical treatment is not indicated in these lesions. It has been recently published by the European Society of Gastrointestinal Endoscopy (ESGE) guidelines about EUS-FNA  referred to the technique and its complications. Regarding to pancreatic lesions they focus in the incidence of acute pancreatitis after EUS-FNA that ranged from 0.26% to 2% respectively. Certain factors have been associated to a predisposition to post-EUS-FNA pancreatitis as a recent history of acute pancreatitis and the puncture of a benign pancreatic lesion; however, a significant relationship was not demonstrated. This guidelines state that EUS-FNA is a safe procedure with a general complication rate of approximately 1% (for all kind of lesions), emphasizing that they are more frequent for EUS-FNA of cystic compared with solid lesions. One important point to notice is that the rate of complications does not seem to be superior depending on the needle size used. It also seems that the use of Tru-cut needles of new-histology needles (Procore™ ) in experienced hands do not increase the rate of complications. A fundamental principle in establishing indications for EUS-FNA is a determination as to whether or not the information obtained has the potential to change patient management. In addition, of course EUS-FNA must be technically feasible without intervening vascular structures and informed patient consent must be obtained before the procedure. If the information will not affect patient treatment, maybe the procedure should not be performed. It has been recently published the ESGE guidelines about EUS-guided sampling  including the accepted and suggested indications of this technique, trying to establish some recommendations. As previously stated EUS-FNA presents a high diagnostic accuracy with a relatively low NPV for the diagnosis of pancreatic cancer and is also related to a low complication rate. Due to the universal drawback considered for all sampling techniques available for the pancreas, pre-operative sampling has been not generally advised (i.e., for potentially resectable pancreatic tumors in operable patients). However, differential diagnosis of solid pancreatic masses includes many different types of lesions. Although the predominant tissue type is adenocarcinoma, the differential diagnosis of a solid pancreatic tumor includes squamous-cell carcinoma, acinar-cell carcinoma, lymphoma, neuroendocrine tumor, solid pseudopapillary tumor, autoimmune pancreatitis and focal pancreatitis. In addition, other malignancies can metastasize to the pancreas and present as pancreatic tumors: Renal-cell carcinoma, melanoma, GI stromal tumors, as well as primary cancers of the breast, ovary, thyroid, lung, prostate and colon. [Figure 1] shows some EUS imaging from solid pancreatic lesions, not corresponding to the classical pancreatic adenocarcinoma. Furthermore, tumors with a cystic component may represent other pathology, such as serous cystadenoma, mucinous cystadenoma, intrapapillary mucinous neoplasm, neuroendocrine tumor, simple cyst and pseudocyst. It has been estimated that approximately 6% of patients undergoing pancreaticoduodenoectomy have a benign process. Another 6% of patient may have an unusual histology, including tumors that have metastasized to the pancreas. Therefore, to minimize the number of patients undergoing non-therapeutic surgeries, a pre-treatment tissue diagnosis is strongly recommended in most cases. When focusing in pancreatic solid masses suspicious for cancer, those may be classified into masses that will not be resected because they are locally advanced, associated with metastases, or they present in patients with a poor physical condition; and potentially resectable solid pancreatic tumors. Sampling in order to obtain a definitive diagnosis is usually desirable to assist with counseling and planning palliation. In fact, pathological confirmation is considered absolutely necessary in a patient with unresectable pancreatic cancer before chemotherapy and/or radiation therapy. Although some authors believe that histological evidence need not be obtained when imaging findings are typical of pancreatic cancer; however, non-ductal pancreatic cancer may have imaging features identical to the common ductal-adenocarcinoma. These patients may be refractory to chemotherapy. Even more, taking into account the latest advances in the field of oncology and in the knowledge about the biology of pancreatic cancer  we have now-a-days the possibility to perform different analysis from FNA and/or FNB samples (mainly biomarkers  which may provide with crucial information to guide the oncological treatment of pancreatic cancer patients. ,,, This mean that we can direct the oncological treatment based on the evaluation of the sample obtained from the tumor. In this context, some patients with locally advanced pancreatic cancer have survived more than 2 years after chemotherapy/radiation therapy. In summary, when a patient presents with a solid pancreatic lesion, a tissue diagnosis is strongly recommended in those cases in which oncological therapy is recommended (metastatic, locally advanced and unresectable pancreatic cancer). If pancreatic lesion is resectable or borderline resectable, a tissue diagnosis is, now-a-days, also recommended, as long as tissue acquisition has a high yield, is safe and does not delay management and may be necessary for neoadjuvant therapy. Certainly, if the patient is a good surgical candidate and the clinical presentation and imaging is typical for resectable adenocarcinoma, then one may proceed without a tissue diagnosis. Another circumstances mandatory for tissue diagnosis are patient demands for a conclusive diagnosis of cancer before surgery and exclusion of unusual tumors (e.g., lymphoma, some pancreatic metastases, autoimmune pancreatitis) if they are suspected, that would not benefit from surgery. As we have previously stated, EUS-FNA, due to its safety and accuracy, is the best modality for tumor detection and for obtaining a tissue diagnosis even if the tumor is poorly visualized by other imaging modalities. 1. Iglesias-García J, Lindkvist B, Lariño-Noia J, et al. The role of EUS in relation to other imaging modalities in the differential diagnosis between mass forming chronic pancreatitis, autoimmune pancreatitis and ductal pancreatic adenocarcinoma. Rev Esp Enferm Dig 2012:104;315-21. 2. Iglesias García J, Lariño Noia J, Domínguez Muñoz JE. Endoscopic ultrasound in the diagnosis and staging of pancreatic cancer. Rev Esp Enferm Dig 2009:101;631-8. 3. Dewitt J, Devereaux BM, Lehman GA, et al. Comparison of endoscopic ultrasound and computed tomography for the preoperative evaluation of pancreatic cancer: A systematic review. Clin Gastroenterol Hepatol 2006:4;717-25. 4. Sãftoiu A, Vilmann P. Role of endoscopic ultrasound in the diagnosis and staging of pancreatic cancer. J Clin Ultrasound 2009:37;1-17. 5. Varadarajulu S, Eloubeidi MA. 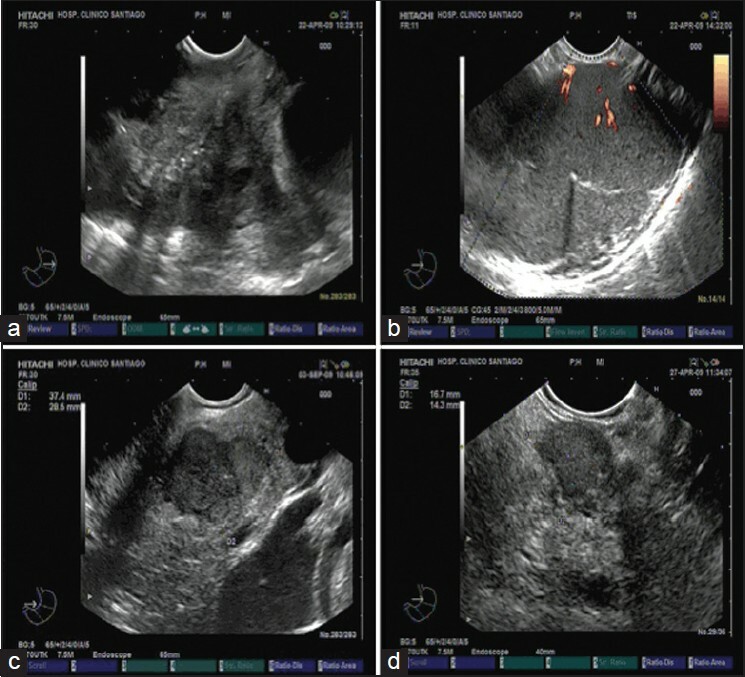 The role of endoscopic ultrasonography in the evaluation of pancreatico-biliary cancer. Gastrointest Endosc Clin N Am 2005:15;497-511. 6. Klapman JB, Chang KJ, Lee JG, et al. Negative predictive value of endoscopic ultrasound in a large series of patients with a clinical suspicion of pancreatic cancer. Am J Gastroenterol 2005:100;2658-61. 7. Catanzaro A, Richardson S, Veloso H, et al. Long-term follow-up of patients with clinically indeterminate suspicion of pancreatic cancer and normal EUS. Gastrointest Endosc 2003:58;836-40. 8. Iglesias García J, Domínguez-Muñoz JE. Endoscopic ultrasound-guided biopsy for the evaluation of pancreatic tumors. Gastroenterol Hepatol 2007:30;597-601. 9. Eloubeidi MA, Tamhane A. Prospective assessment of diagnostic utility and complications of endoscopic ultrasound-guided fine needle aspiration. Results from a newly developed academic endoscopic ultrasound program. Dig Dis 2008:26;356-63. 10. Puli SR, Bechtold ML, Buxbaum JL, et al. How good is endoscopic ultrasound-guided fine-needle aspiration in diagnosing the correct etiology for a solid pancreatic mass? : A meta-analysis and systematic review. Pancreas 2013:42;20-6. 11. Giovannini M, Seitz JF, Monges G, et al. Fine-needle aspiration cytology guided by endoscopic ultrasonography: Results in 141 patients. Endoscopy 1995:27;171-7. 12. Bhutani MS, Hawes RH, Baron PL, et al. Endoscopic ultrasound guided fine needle aspiration of malignant pancreatic lesions. Endoscopy 1997:29;854-8. 13. Gress FG, Hawes RH, Savides TJ, et al. Endoscopic ultrasound-guided fine-needle aspiration biopsy using linear array and radial scanning endosonography. Gastrointest Endosc 1997:45;243-50. 14. Chang KJ, Nguyen P, Erickson RA, et al. The clinical utility of endoscopic ultrasound-guided fine-needle aspiration in the diagnosis and staging of pancreatic carcinoma. Gastrointest Endosc 1997:45; 387-93. 15. Wiersema MJ, Vilmann P, Giovannini M, et al. Endosonography-guided fine-needle aspiration biopsy: Diagnostic accuracy and complication assessment. Gastroenterology 1997:112;1087-95. 16. Gress F, Gottlieb K, Sherman S, et al. Endoscopic ultrasonography-guided fine-needle aspiration biopsy of suspected pancreatic cancer. Ann Intern Med 2001:134;459-64. 17. Harewood GC, Wiersema MJ. Endosonography-guided fine needle aspiration biopsy in the evaluation of pancreatic masses. Am J Gastroenterol 2002:97;1386-91. 18. Eloubeidi MA, Chen VK, Eltoum IA, et al. Endoscopic ultrasound-guided fine needle aspiration biopsy of patients with suspected pancreatic cancer: Diagnostic accuracy and acute and 30-day complications. Am J Gastroenterol 2003:98;2663-8. 19. Ardengh JC, Lopes CV, de Lima LF, et al. Diagnosis of pancreatic tumors by endoscopic ultrasound-guided fine-needle aspiration. World J Gastroenterol 2007:13;3112-6. 20. Iglesias-Garcia J, Dominguez-Munoz E, Lozano-Leon A, et al. Impact of endoscopic ultrasound-guided fine needle biopsy for diagnosis of pancreatic masses. World J Gastroenterol 2007:13;289-93. 21. Iglesias-Garcia J, Dominguez-Munoz JE, Abdulkader I, et al. Influence of on-site cytopathology evaluation on the diagnostic accuracy of endoscopic ultrasound-guided fine needle aspiration (EUS-FNA) of solid pancreatic masses. Am J Gastroenterol 2011:106;1705-10. 22. Hartwig W, Schneider L, Diener MK, et al. Preoperative tissue diagnosis for tumours of the pancreas. Br J Surg 2009:96;5-20. 23. Hewitt MJ, McPhail MJ, Possamai L, et al. EUS-guided FNA for diagnosis of solid pancreatic neoplasms: A meta-analysis. Gastrointest Endosc 2012:75;319-31. 24. Varadarajulu S, Tamhane A, Eloubeidi MA. Yield of EUS-guided FNA of pancreatic masses in the presence or the absence of chronic pancreatitis. Gastrointest Endosc 2005:62;728-36. 25. Ardengh JC, Lopes CV, Campos AD, et al. Endoscopic ultrasound and fine needle aspiration in chronic pancreatitis: Differential diagnosis between pseudotumoral masses and pancreatic cancer. JOP 2007:8; 413-21. 26. Erturk SM, Mortelé KJ, Tuncali K, et al. Fine-needle aspiration biopsy of solid pancreatic masses: Comparison of CT and endoscopic sonography guidance. AJR Am J Roentgenol 2006:187;1531-5. 27. Horwhat JD, Paulson EK, McGrath K, et al. A randomized comparison of EUS-guided FNA versus CT or US-guided FNA for the evaluation of pancreatic mass lesions. Gastrointest Endosc 2006:63;966-75. 28. Volmar KE, Vollmer RT, Jowell PS, et al. Pancreatic FNA in 1000 cases: A comparison of imaging modalities. Gastrointest Endosc 2005:61;854-61. 29. Mallery JS, Centeno BA, Hahn PF, et al. Pancreatic tissue sampling guided by EUS, CT/US, and surgery: A comparison of sensitivity and specificity. Gastrointest Endosc 2002:56;218-24. 30. Chen VK, Arguedas MR, Kilgore ML, et al. A cost-minimization analysis of alternative strategies in diagnosing pancreatic cancer. Am J Gastroenterol 2004:99;2223-34. 31. DeWitt J, LeBlanc J, McHenry L, et al. Endoscopic ultrasound-guided fine needle aspiration cytology of solid liver lesions: A large single-center experience. Am J Gastroenterol 2003:98;1976-81. 32. DeWitt J, LeBlanc J, McHenry L, et al. Endoscopic ultrasound-guided fine-needle aspiration of ascites. Clin Gastroenterol Hepatol 2007:5;609-15. 33. DeWitt J, Yu M, Al-Haddad MA, et al. Survival in patients with pancreatic cancer after the diagnosis of malignant ascites or liver metastases by EUS-FNA. Gastrointest Endosc 2010:71;260-5. 34. Mortensen MB, Pless T, Durup J, et al. Clinical impact of endoscopic ultrasound-guided fine needle aspiration biopsy in patients with upper gastrointestinal tract malignancies. A prospective study. Endoscopy 2001:33;478-83. 35. Wiersema MJ, Levy MJ, Harewood GC, et al. Initial experience with EUS-guided trucut needle biopsies of perigastric organs. Gastrointest Endosc 2002:56;275-8. 36. Levy MJ, Jondal ML, Clain J, et al. Preliminary experience with an EUS-guided trucut biopsy needle compared with EUS-guided FNA. Gastrointest Endosc 2003:57;101-6. 37. Levy MJ, Wiersema MJ. EUS-guided Trucut biopsy. Gastrointest Endosc 2005:62;417-26. 38. Jenssen C, Dietrich CF. Endoscopic ultrasound-guided fine-needle aspiration biopsy and trucut biopsy in gastroenterology - An overview. Best Pract Res Clin Gastroenterol 2009:23;743-59. 39. Larghi A, Verna EC, Stavropoulos SN, et al. EUS-guided trucut needle biopsies in patients with solid pancreatic masses: A prospective study. Gastrointest Endosc 2004:59;185-90. 40. Wahnschaffe U, Ullrich R, Mayerle J, et al. EUS-guided Trucut needle biopsies as first-line diagnostic method for patients with intestinal or extraintestinal mass lesions. Surg Endosc 2009:23;2351-5. 41. Thomas T, Kaye PV, Ragunath K, et al. Efficacy, safety, and predictive factors for a positive yield of EUS-guided Trucut biopsy: A large tertiary referral center experience. Am J Gastroenterol 2009:104;584-91. 42. Iglesias-Garcia J, Poley JW, Larghi A, et al. Feasibility and yield of a new EUS histology needle: Results from a multicenter, pooled, cohort study. Gastrointest Endosc 2011:73;1189-96. 43. Petrone MC, Poley JW, Bonzini M, et al. Interobserver agreement among pathologists regarding core tissue specimens obtained with a new endoscopic ultrasound histology needle: A prospective multicentre study in 50 cases. Histopathology 2013:62;602-8. 44. Larghi A, Iglesias-Garcia J, Poley JW, et al. Feasibility and yield of a novel 22-gauge histology EUS needle in patients with pancreatic masses: A multicenter prospective cohort study. Surg Endosc 2013:27;3733-8. 45. Figueiredo FA, Giovannini M, Monges G, et al. Pancreatic endocrine tumors: A large single-center experience. Pancreas 2009:38;936-40. 46. Pais SA, Al-Haddad M, Mohamadnejad M, et al. EUS for pancreatic neuroendocrine tumors: A single-center, 11-year experience. Gastrointest Endosc 2010:71;1185-93. 47. Figueiredo FA, Giovannini M, Monges G, et al. EUS-FNA predicts 5-year survival in pancreatic endocrine tumors. Gastrointest Endosc 2009:70;907-14. 48. Fasanella KE, McGrath KM, Sanders M, et al. Pancreatic endocrine tumor EUS-guided FNA DNA microsatellite loss and mortality. Gastrointest Endosc 2009:69;1074-80. 49. Piani C, Franchi GM, Cappelletti C, et al. Cytological Ki-67 in pancreatic endocrine tumours: An opportunity for pre-operative grading. Endocr Relat Cancer 2008:15;175-81. 50. Chatzipantelis P, Konstantinou P, Kaklamanos M, et al. The role of cytomorphology and proliferative activity in predicting biologic behavior of pancreatic neuroendocrine tumors: A study by endoscopic ultrasound-guided fine-needle aspiration cytology. Cancer 2009:117;211-6. 51. Fritscher-Ravens A, Sriram PV, Krause C, et al. Detection of pancreatic metastases by EUS-guided fine-needle aspiration. Gastrointest Endosc 2001:53;65-70. 52. Rodríguez-Pérez R, Iglesias-García J, Alvarez-del-Castillo M, et al. Usefulness of endoscopic ultrasound in the evaluation of a lymphoma with multiple gastric and pancreatic lesions. Rev Esp Enferm Dig 2012:104;322-3. 53. Eloubeidi MA, Varadarajulu S, Desai S, et al. Value of repeat endoscopic ultrasound-guided fine needle aspiration for suspected pancreatic cancer. J Gastroenterol Hepatol 2008:23;567-70. 54. Suzuki R, Lee JH, Krishna SG, et al. Repeat endoscopic ultrasound-guided fine needle aspiration for solid pancreatic lesions at a tertiary referral center will alter the initial inconclusive result. J Gastrointestin Liver Dis 2013:22;183-7. 55. DeWitt J, McGreevy K, Sherman S, et al. Utility of a repeated EUS at a tertiary-referral center. Gastrointest Endosc 2008:67;610-9. 56. Polkowski M, Larghi A, Weynand B, et al. Learning, techniques, and complications of endoscopic ultrasound (EUS)-guided sampling in gastroenterology: European Society of Gastrointestinal Endoscopy (ESGE) Technical Guideline. Endoscopy 2012:44;190-206. 57. Eloubeidi MA, Tamhane A, Varadarajulu S, et al. Frequency of major complications after EUS-guided FNA of solid pancreatic masses: A prospective evaluation. Gastrointest Endosc 2006:63;622-9. 58. Wang KX, Ben QW, Jin ZD, et al. Assessment of morbidity and mortality associated with EUS-guided FNA: A systematic review. Gastrointest Endosc 2011:73;283-90. 59. Chong A, Venugopal K, Segarajasingam D, et al. Tumor seeding after EUS-guided FNA of pancreatic tail neoplasia. Gastrointest Endosc 2011:74;933-5. 60. Micames C, Jowell PS, White R, et al. Lower frequency of peritoneal carcinomatosis in patients with pancreatic cancer diagnosed by EUS-guided FNA vs. percutaneous FNA. Gastrointest Endosc 2003:58;690-5. 61. Beane JD, House MG, Coté GA, et al. Outcomes after preoperative endoscopic ultrasonography and biopsy in patients undergoing distal pancreatectomy. Surgery 2011:150;844-53. 62. Dumonceau JM, Polkowski M, Larghi A, et al. Indications, results, and clinical impact of endoscopic ultrasound (EUS)-guided sampling in gastroenterology: European Society of Gastrointestinal Endoscopy (ESGE) Clinical Guideline. Endoscopy 2011:43;897-912. 63. van Gulik TM, Reeders JW, Bosma A, et al. Incidence and clinical findings of benign, inflammatory disease in patients resected for presumed pancreatic head cancer. Gastrointest Endosc 1997:46;417-23. 64. Paulson AS, Tran Cao HS, Tempero MA, et al. Therapeutic advances in pancreatic cancer. Gastroenterology 2013:144;1316-26. 65. Matthaios D, Zarogoulidis P, Balgouranidou I, et al. Molecular pathogenesis of pancreatic cancer and clinical perspectives. Oncology 2011:81;259-72. 66. Roberts AS, Campa MJ, Gottlin EB, et al. Identification of potential prognostic biomarkers in patients with untreated, advanced pancreatic cancer from a phase 3 trial (Cancer and Leukemia Group B 80303). Cancer 2012:118;571-8. 67. Farrell JJ, Elsaleh H, Garcia M, et al. Human equilibrative nucleoside transporter 1 levels predict response to gemcitabine in patients with pancreatic cancer. Gastroenterology 2009:136;187-95. 68. Van Cutsem E, Vervenne WL, Bennouna J, et al. Phase III trial of bevacizumab in combination with gemcitabine and erlotinib in patients with metastatic pancreatic cancer. J Clin Oncol 2009:27; 2231-7. 69. Kindler HL, Ioka T, Richel DJ, et al. Axitinib plus gemcitabine versus placebo plus gemcitabine in patients with advanced pancreatic adenocarcinoma: A double-blind randomised phase 3 study. Lancet Oncol 2011:12;256-62. 70. Innocenti F, Owzar K, Cox NL, et al. A genome-wide association study of overall survival in pancreatic cancer patients treated with gemcitabine in CALGB 80303. Clin Cancer Res 2012:18;577-84. 71. Mortenson MM, Katz MH, Tamm EP, et al. Current diagnosis and management of unusual pancreatic tumors. Am J Surg 2008:196; 100-13. 72. Evans DB, Varadhachary GR, Crane CH, et al. Preoperative gemcitabine-based chemoradiation for patients with resectable adenocarcinoma of the pancreatic head. J Clin Oncol 2008:26;3496-502. 73. Estrella JS, Rashid A, Fleming JB, et al. Post-therapy pathologic stage and survival in patients with pancreatic ductal adenocarcinoma treated with neoadjuvant chemoradiation. Cancer 2012:118;268-77. 74. Varadhachary GR, Tamm EP, Abbruzzese JL, et al. Borderline resectable pancreatic cancer: Definitions, management, and role of preoperative therapy. Ann Surg Oncol 2006:13;1035-46. 75. Katz MH, Pisters PW, Evans DB, et al. Borderline resectable pancreatic cancer: The importance of this emerging stage of disease. J Am Coll Surg 2008:206;833-46. 76. Katz MH, Fleming JB, Bhosale P, et al. Response of borderline resectable pancreatic cancer to neoadjuvant therapy is not reflected by radiographic indicators. Cancer 2012:118;5749-56. 77. Wasif N, Ko CY, Farrell J, et al. Impact of tumor grade on prognosis in pancreatic cancer: Should we include grade in AJCC staging? Ann Surg Oncol 2010:17;2312-20. 78. Levy MJ, Wiersema MJ, Chari ST. Chronic pancreatitis: Focal pancreatitis or cancer? Is there a role for FNA/biopsy? Autoimmune pancreatitis. Endoscopy 2006:38 Suppl 1;S30-5. 79. Varas M, Gornals J, Prieto JL, et al. Diagnostic protocol for pancreatic neuroendocrine tumors (PNETs). Rev Esp Enferm Dig 2012:104;29-32. 80. Maimone A, Luigiano C, Baccarini P, et al. Preoperative diagnosis of a solid pseudopapillary tumour of the pancreas by Endoscopic Ultrasound Fine Needle Biopsy: A retrospective case series. Dig Liver Dis 2013:45;957-60. 81. Bertucci F, Araujo J, Giovannini M. Pancreatic metastasis from osteosarcoma and Ewing sarcoma: Literature review. Scand J Gastroenterol 2013:48;4-8. 82. Singh D, Vaidya OU, Sadeddin E, et al. Role of endoscopic ultrasound and endoscopic retrograde cholangiopancreatography in isolated pancreatic metastasis from lung cancer. World J Gastrointest Endosc 2012:4;328-30. 2 Endoscopic ultrasound and endoscopic retrograde cholangiopancreatography: Can they be successfully combined? 4 Endoscopic ultrasound and endoscopic retrograde cholangiopancreatography: Can they be successfully combined?